The Boston String Quartet returns this holiday season for their 3rd annual Christmas series entitled “Christmas in Paris”. With over 40 showings of their last two series, “Christmas in Buenos Aires” and “A Celtic Christmas Extravaganza”, the Quartet will be exploring Parisian Life by presenting music from hit movies such as Scorsese’s “Hugo” and the French award winning “The Illusionist”, music from the beloved Edith Piaf, and traditional French carols. NEW in 2012 will be soaring videos of the Eiffel Tower, Notre Dame, Louvre to accompany the music. The Boston String Quartet is one of very few string ensembles forging new territory in the string world by writing all original music and arrangements. 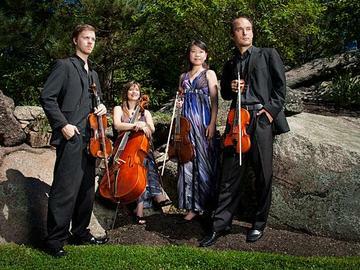 Contemporaries and collaborators with the Boston String Quartet include ensembles such as the GRAMMY Winning Turtle Island and Kronos Quartets, and string celebrities such as Mark O Connor and Edgar Meyer. “By writing original compositions for string quartet, we are paving a way for our traditional instruments in a world of contemporary music” says cellist, Christina Stripling. Under 18 FREE! Concert tickets are $20 to the general public. For more information, or to schedule interviews please call (617) 875-7851 or visit www.bostonstringquartet.com.